I have been living in the southeast of England for the last seven years, and still exploring the rich history the area has to offer. 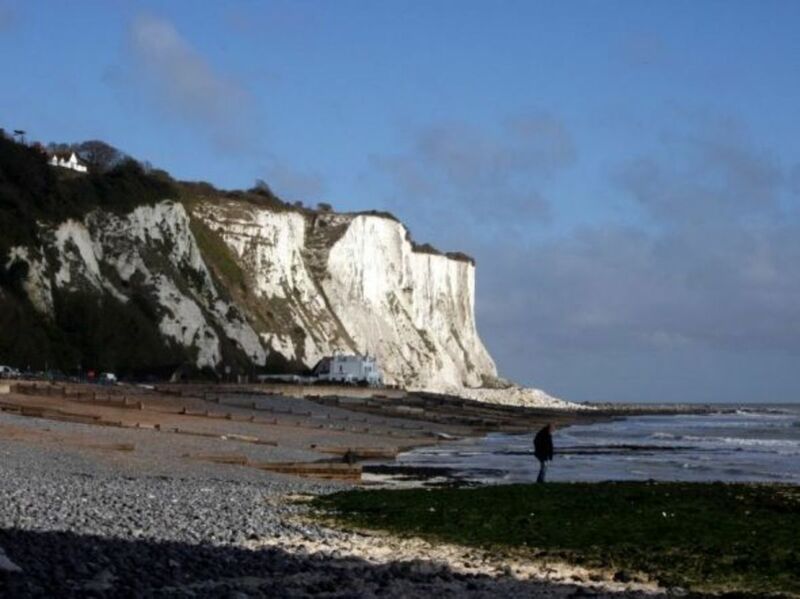 The White Cliffs of Dover are not a single stretch of chalk cliff, but they extend on either side of Dover and are made up of different ranges of cliffs and bays, each with their own names. 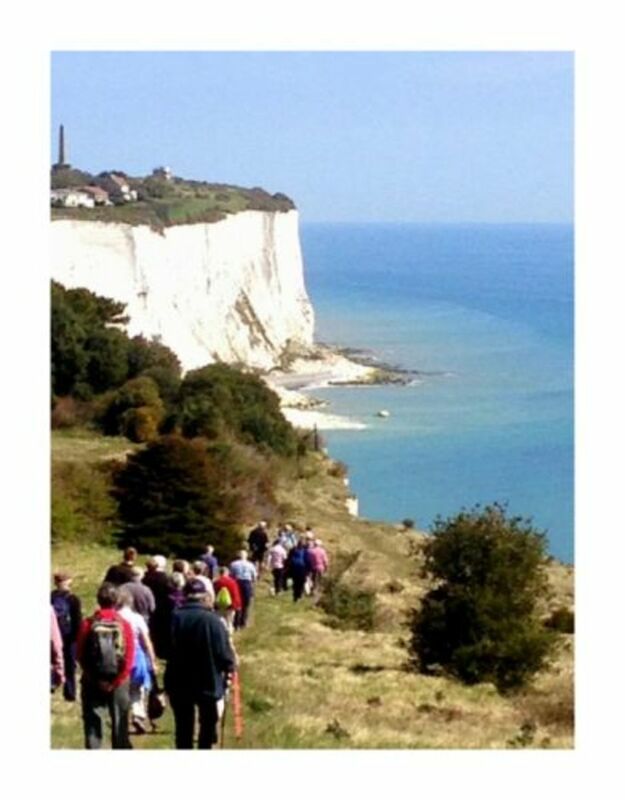 They extend from Dover to Kingsdown to the north where they peter out, then in the other direction to Folkestone where the white chalk gives way to cliffs of sandstone and clay. The National Trust owns the section from Langdon Cliffs, beside Dover, as far as the South Foreland lighthouse near St Margaret's Bay, somewhere I used to visit very frequently when my sons were young and my parents lived nearby. 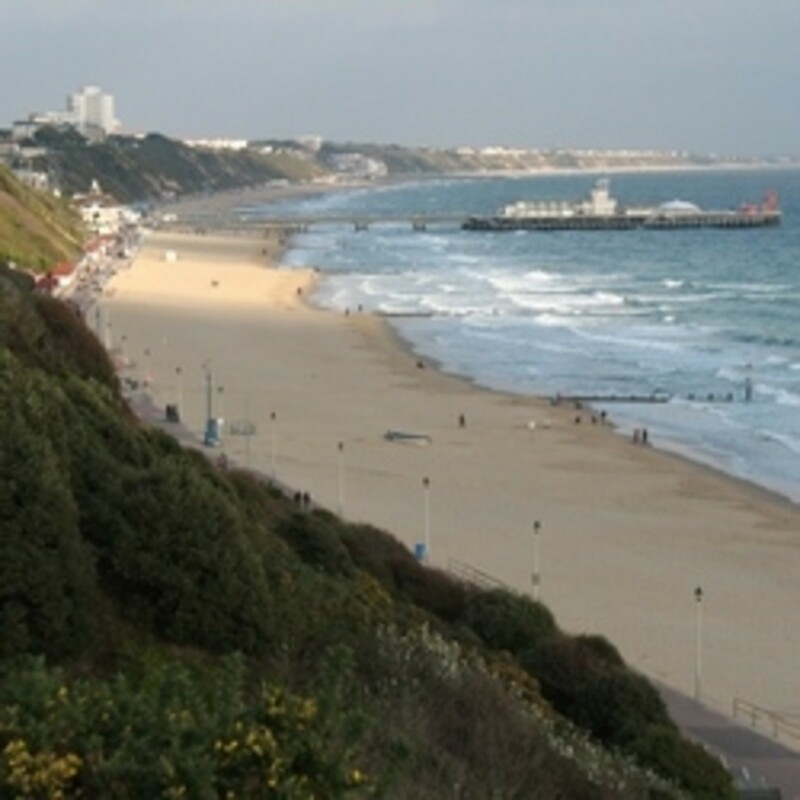 I have been able to visit the St Margaret's Bay again more recently when we moved to this area. The photos shown here are all my own. Some were taken in the winter and others in the summer but I think you'll be able to tell which is which. You can see here that although this is a rocky beach, rather like the beach near my own home, the beach with no sand, there is nevertheless quite an amount of sand in places. 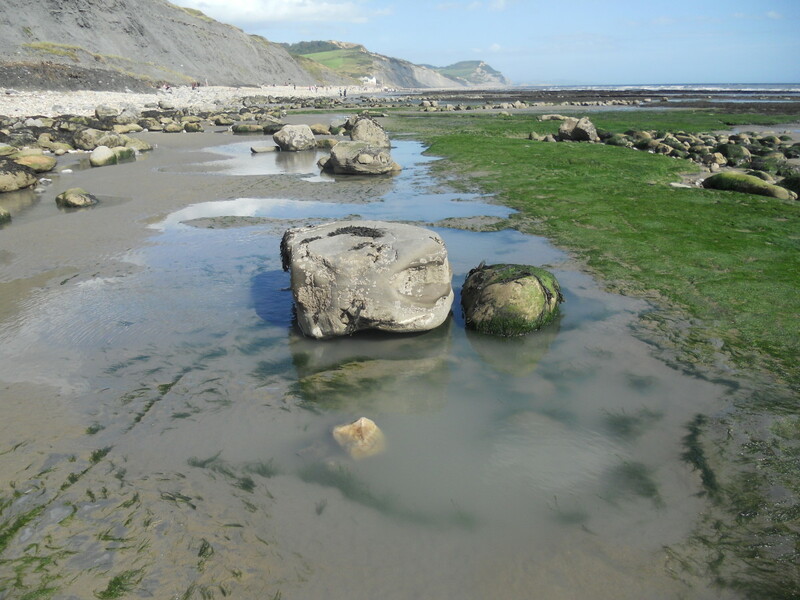 And you may be able to see that the flinty pebbles in the foreground are still embedded in the chalky rock. 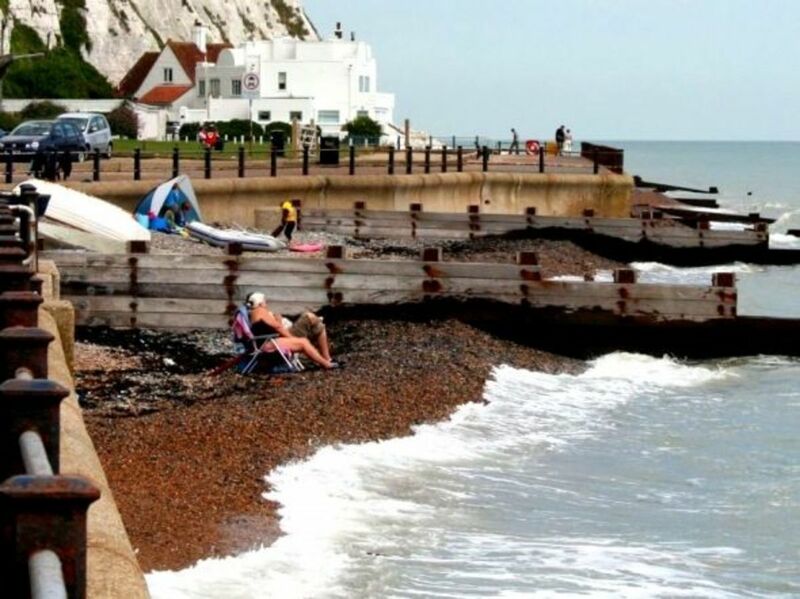 As the sea gradually wears away the softer chalk, the flints are left to roll around in the sea and form the rounded pebbles of a shingle beach. In the background you can see, under and very close to the cliffs themselves, the house possibly not very imaginatively known as "White Cliffs". It was once owned by Noel Coward and later by Ian Fleming. Noel Coward bought the house, "White Cliffs", which you can see more clearly in the background of this photo, in 1945 just as the Second World War ended. During the war the bay and the house had been used for training troops for the D-Day landings so Noel Coward had to embark on a total renovation. 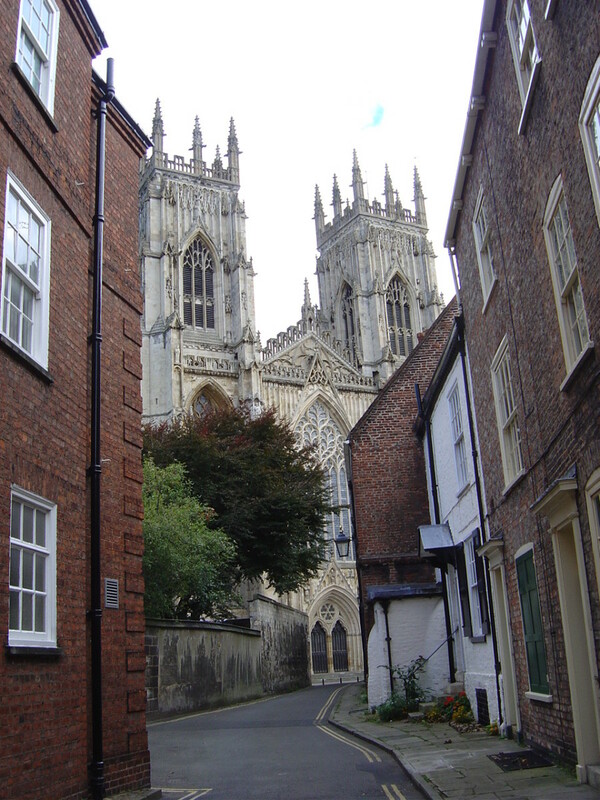 He lived there six years during which time he wrote some of his best known works, including "Blithe Spirit". In 1951 he sold "White Cliffs" to Ian Fleming, the author of the James Bond series of books. His third novel, Moonraker, was published in 1955 and is thought to be set in and around St Margaret's Bay. While I was taking these pictures, the couple in the foreground of the picture amused me. As the tide came in closer and closer, they showed no sign of any concern or moving further back. Each time a wave lapped close, they lifted their feet as long as necessary and resumed their conversation. There is evidence all over the whole of this area (sometimes known as Hellfire Corner because of the battering it received during WWII) of wartime defences and training. 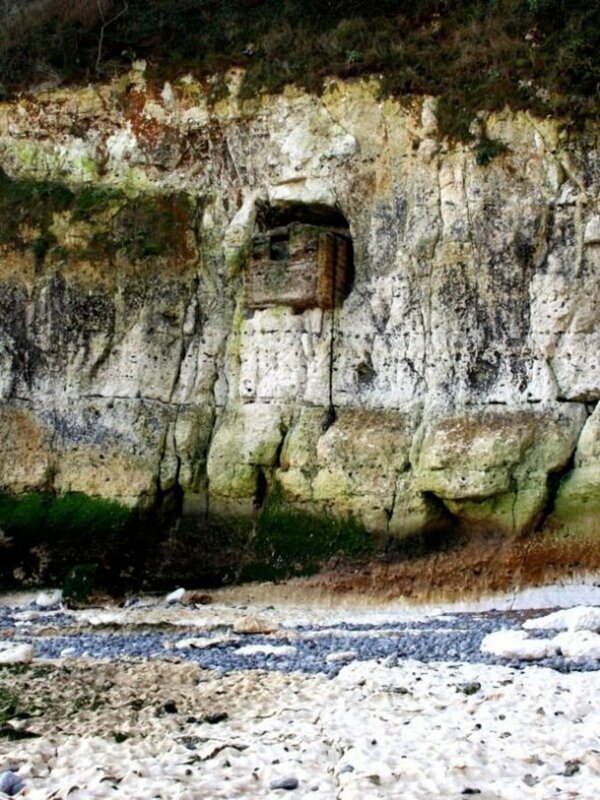 St. Margaret's Bay was no exception and here you can see a gun emplacement in one of the many caves in the cliff. If you look carefully you can see a rope has been tied to it, no doubt to aid exploration by local youngsters. The cliffs are riddled with caves. My son tells me they used to explore them when they were children. I really wish I didn't know that. Many were used in various ways during the war but before that they were often put to good use by the smugglers who seemed to abound in this area. 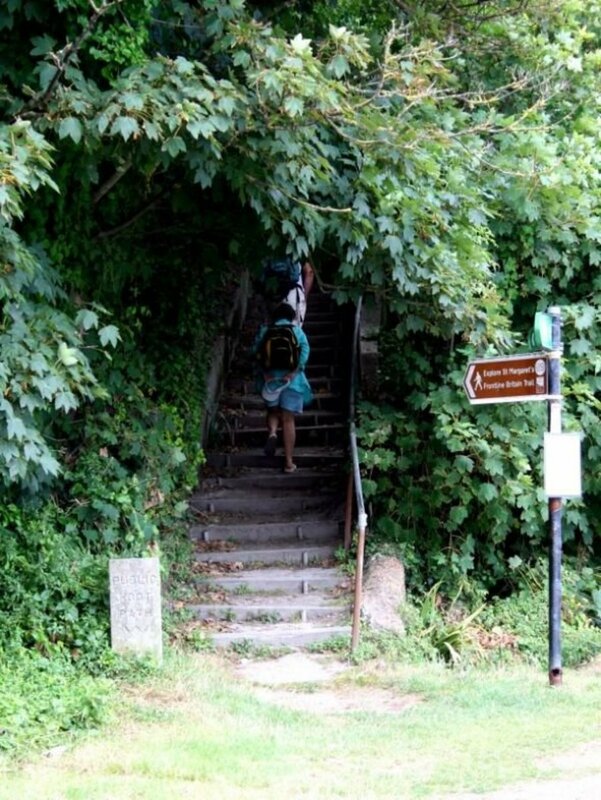 Going back a good few years, probably 20 years, there was a narrow and very rough pathway to the top of the cliffs. You didn't walk up or down, you scrambled. Alternatively you could follow the road which winds its way from the village down to the foot of the cliffs. Guess which way my sons preferred? I notice the pathway has now been tamed and is paved with steps. My now very grown up sons are quite disgusted that it's no longer the adventure it once was. Nevertheless, it's still quite a way to the top and will keep anyone who frequents it very fit. There are rewards at the top, inside the Bluebirds Tea Rooms, that may undo at least some of the benefits of the climb! The signpost invites you to explore St Margaret's on the Frontline Britain Trail. Part of the cliffs fall into the sea quite regularly. This picture shows a landslide from March 2012, not in St Margaret's Bay but near Langdon Bay, closer to Dover. It made international news at the time. 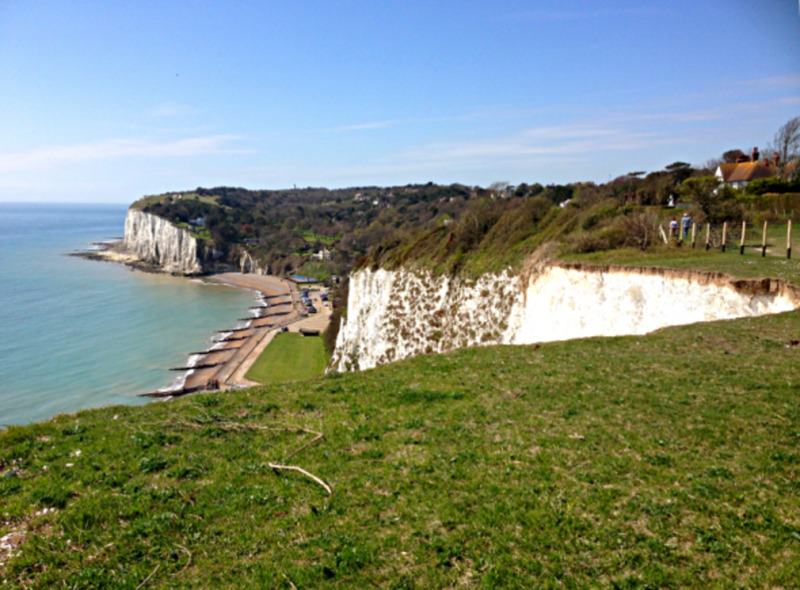 Now, March 2013, we hear of quite a substantial fall in St Margaret's Bay itself, very close to the White Cliffs house. 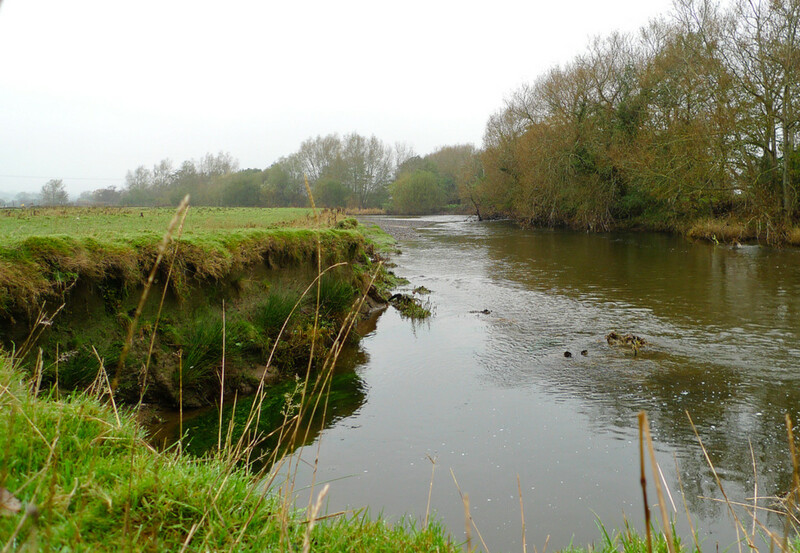 You can read and see all about it in our local news websites, This Is Kent, and Kent Online. The fall in Langdon Bay was far larger but this latest one is nevertheless spectacular and demonstrates the dangers of walking to close to the cliff edge. You just never know when it will happen. 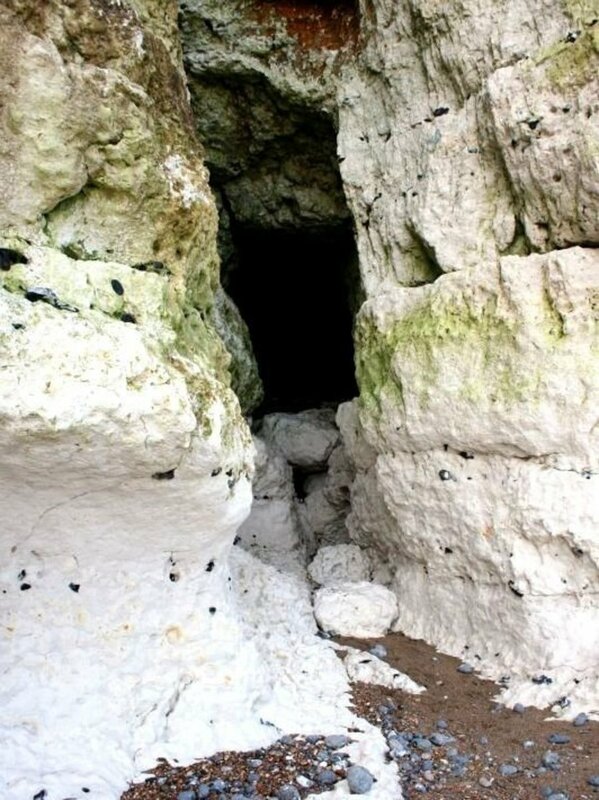 The newly exposed chalk is always very startlingly white but within just a few days it takes on a greenish greyish colour not entirely, as you might suppose, from dirty air (though I suppose that has some effect), but it's the action of microbes and plant life in the main. Just a short time after the cliff fall, I went walking in St Margaret's Bay again. Even after six weeks you can still see the way the waves are washing away the chalk which has pushed out into the sea, making the water look milky around and beyond the immediate area of the fall. After a detour to the beach I went back up to the top of the cliffs to see for myself at closer range where a roughly semi-circular portion is now missing from the original line. It's almost as if something had taken a bite out of the land. You will notice that there is a fence around the area keeping everyone at a safe distance. Notice the difference between the bright white of the newly exposed cliff face and the part which has vegetation growing on it. Apparently the newly exposed chalk will start to discolour in a matter of hours. Wow! I walked further than I thought! Right from the lighthouse on the cliffs on the far side of the beach, down to the beach and back up again. I didn't get nearly as close to the edge as it might look from the photos. I stayed well behind the barriers. Whether you make it up to the top by foot or by car or any other means, you'll be rewarded by the most wonderful views, often all the way to France if it's clear enough. 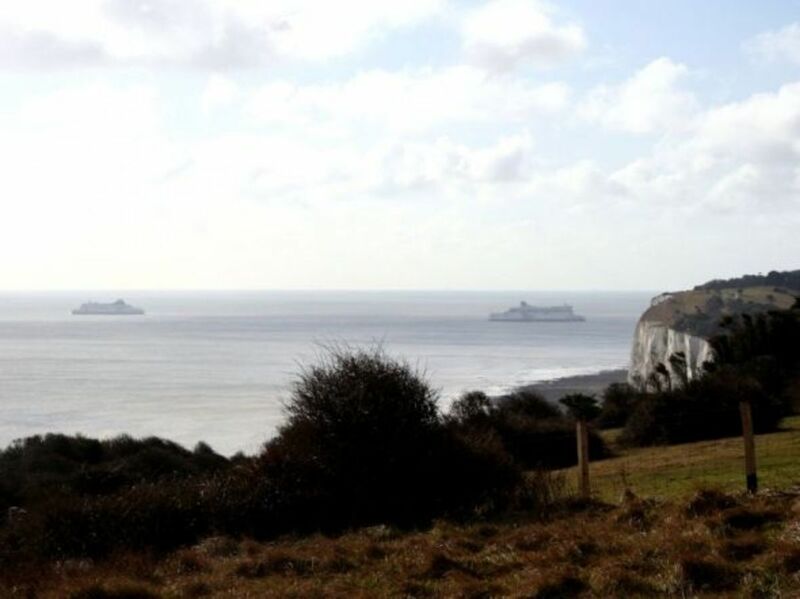 Here you can see the ferries plying their way into the port of Dover, the busiest passenger port in the world and overlooking the busiest seaway in the world. No, you can't see many ships in this picture but the haze hides all sorts including the French coast. When the coast is visible they say we're in for bad weather. At night when the lights are on there is far more to see. 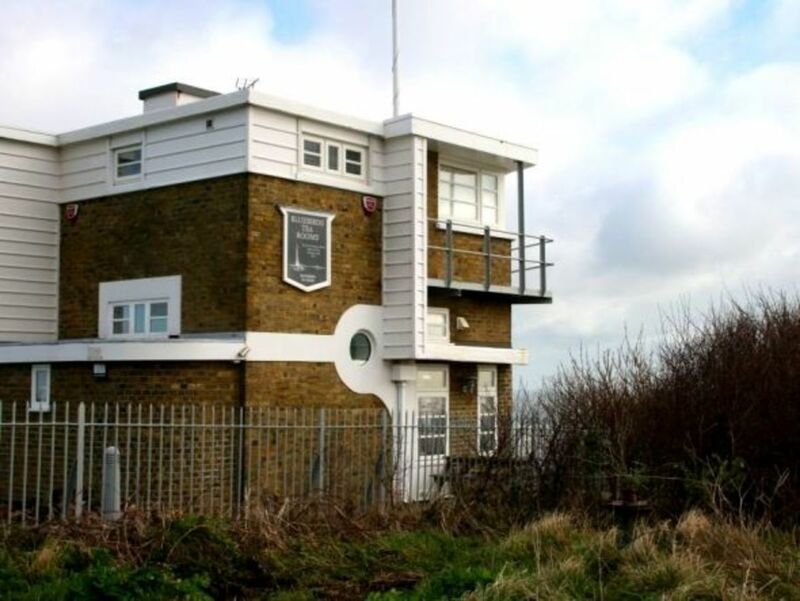 This building, perched on top of the cliff, was once a coastguard station at St Margaret's Bay. It may not look especially inviting but I can assure you that inside is full of wonderful temptations in the form of home baked cakes and other delights. It takes its name "Bluebirds Tea Rooms" from the Vera Lynn song, "There'll Be Bluebirds Over The White Cliffs of Dover", popular during World Ward II. As well as a cosy and welcoming interior, it has tables outside from which you can again enjoy the spectacular views. A perfect spot for a break but don't go too close to the cliff edge! Have you ever seen the White Cliffs? 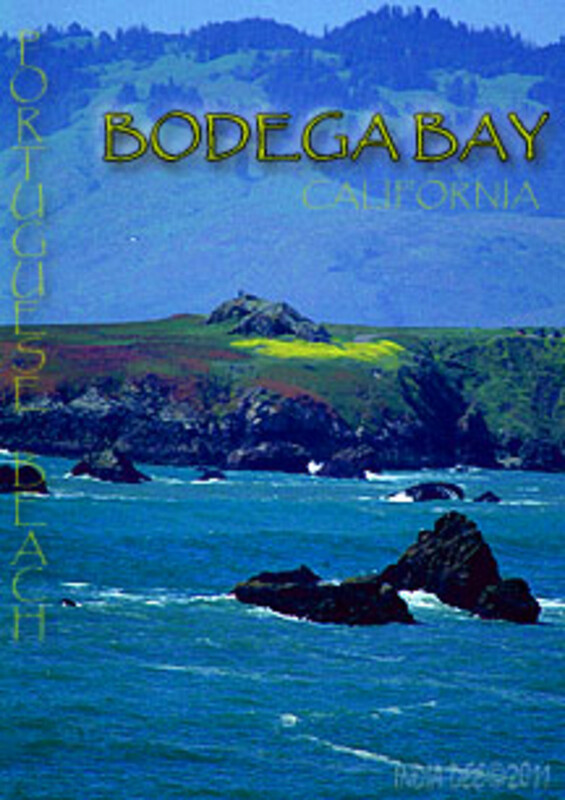 - Do you have a similar stretch of coastline near you? When we lived in London, we regularly traveled down to Dover to take the ferry across the Channel. The cliffs were always a welcome sight! The only bad part about hiking along the top is that in many places there are no guard rails and our son loved to sprint ahead without any thought -- we had to keep a close rein on him! @Lensmaster...In the past, I was a frequent visitor of the South Lake Erie shoreline in Ohio, USA. 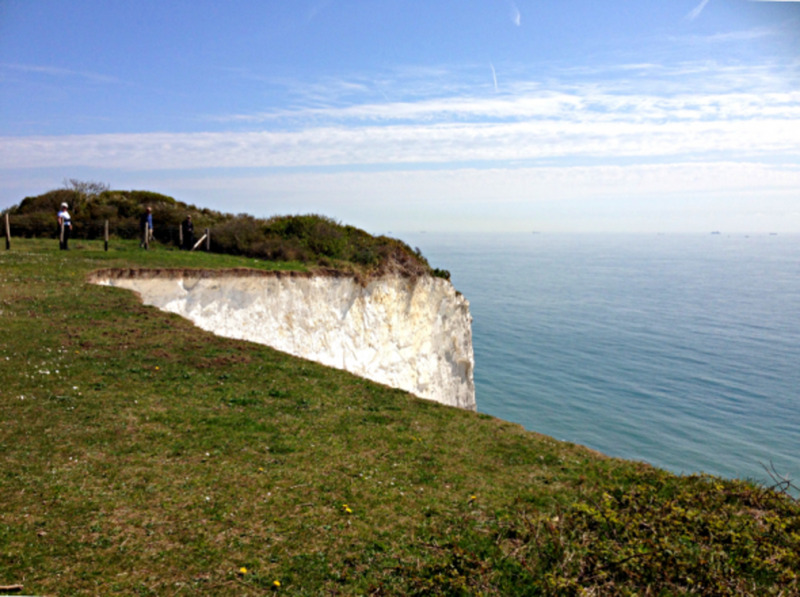 However much I enjoyed it, its view could not outshine that of your White Cliffs. 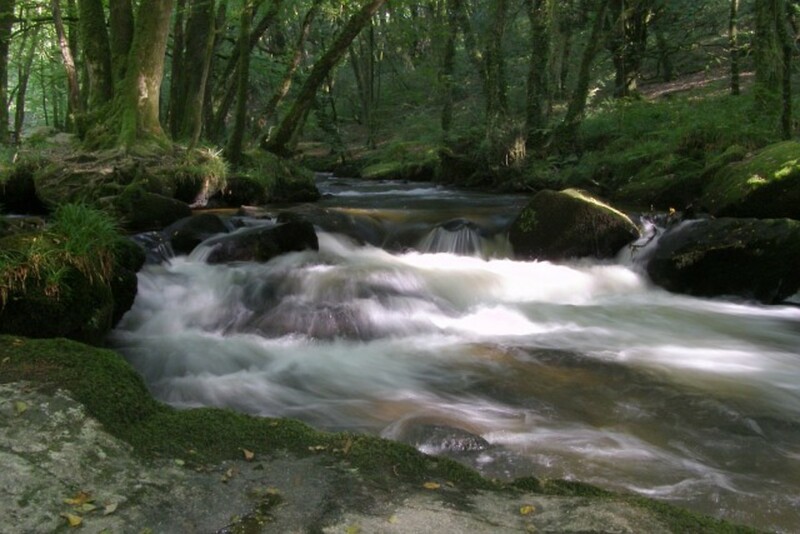 What a wonderful place you have to live and view every day, to say nothing of the writing legacy it embraces! Well worth the Purple Star award! I have been there. I spent two weeks nearby on a school trip in the early 1970s. I had my picture taken by a local newspaper, with about five other classmates, in a coastguard station. I think it might have been that one above. I never really got how we were 'news.' On another note, the song 'White Cliffs of Dover,' isn't it funny that we don't actually have any bluebirds in the UK? The song was written by an American and he forgot to check his facts. Having lived in England for 20 years I never saw the White Cliffs properly, only usually at night when crossing from Dover to Calais. I will return I promise you! Yes, I saw them about 30 years ago. Hope to get to see them again one day. Great lens with beautiful pictures and interesting stories. I enjoyed it! 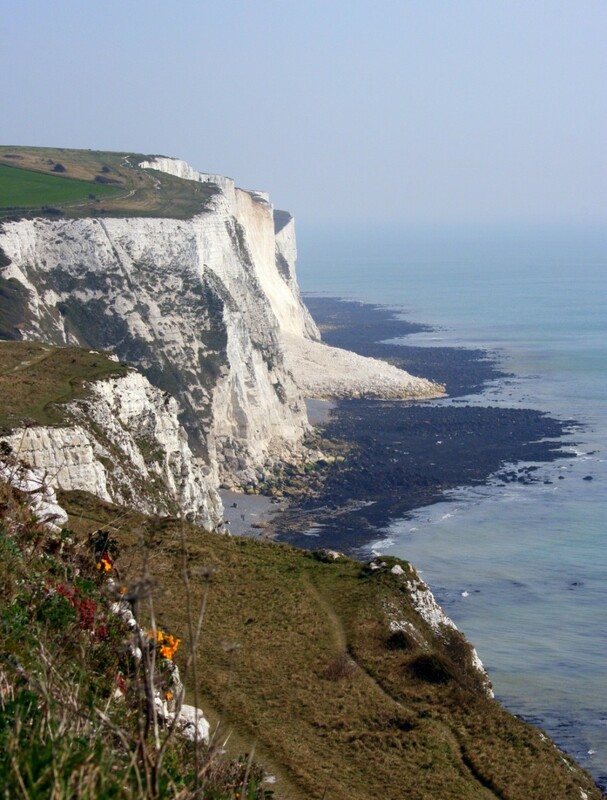 I would love to visit the White Cliffs, they are beautiful.